WOMEN get less satisfaction and enjoyment when smoking cigarettes that come in plain packaging, Scottish research suggests, so says the Scotsman. A study by researchers at Stirling University involved 187 young female smokers who used plain brown packs. The women said they were more embarrassed about smoking from plain packs and felt more negative about it, even though they were using their usual brand. They also reported smoking fewer cigarettes, stubbing out cigarettes early, smoking less around others and thinking more about quitting. The report comes after a Scottish Government strategy to combat smoking backed the use of plain packaging as a measure to help almost eradicate cigarettes. But campaigners condemned the study as “sexist” for suggesting women were so easily influenced by plain packaging. The Stirling researchers wanted to examine the extent to which young women smokers were influenced by the aesthetic appeal of packaging. Their findings echoed an earlier study using the same ­approach and anecdotal evidence in Australia, where standardised packs were introduced last ­December. Dr Crawford Moodie, lead author of the study, said: “Young women are a key target group for both public health and tobacco companies given that smoking prevalence is very high among young women in the UK. “Tobacco companies use slim, elegant packaging to target young women and have been successful in doing so. In contrast, public health initiatives have had limited impact. A UK-wide public consultation on tobacco packaging ended in August last year. While the Scottish Government has backed plain packets, the UK administration has yet to make a decision. Health campaigners want ­colourful packaging to be replaced with packs of uniform size, shape and design, showing health warnings, to reduce the appeal of tobacco to children. A letter published in the Guardian called on the Coalition to act on cigarette packaging. On 5 March the secretary of state for health published his call to action on reducing premature mortality. This correctly identified tobacco use as the biggest single behavioural risk factor for premature death and included a commitment to decide whether to introduce standardised packaging, as recommended by health organisations he consulted, including signatories to this letter (Report, 17 April). But with the Queen's speech only two weeks away, we have yet to hear of any such decision. The arguments in favour of standardised packaging are compelling and we have yet to see any credible evidence from the tobacco industry against legislation. This has clearly been recognised by public health minister Anna Soubry MP, who made clear her support for standardised packaging of tobacco products on the Today programme last Friday. Tobacco, unlike other causes of disease, has a global and powerful industry promoting its interests. JTI Gallaher, maker of Camel, is spending over £2m on its campaign against standard packs, running ads that have been ruled misleading by advertising watchdog the Advertising Standards Authority. With over 200,000 young people taking up smoking every year and 100,000 people dying as a result of their habit, we urgently need assurances from Jeremy Hunt that he will listen to health experts and stand firm against this industry pressure. It will take a lot of explanation if this crucial public health measure is not included in the Queen's speech on 8 May. Click here to read the letter on the Guardian website. Cancer Research UK has won a second victory in as many months against Gallaher, which markets brands including Benson & Hedges, Camel and Silk Cut, after the ad watchdog banned the tobacco giant's campaign attacking proposals for plain cigarette packaging. 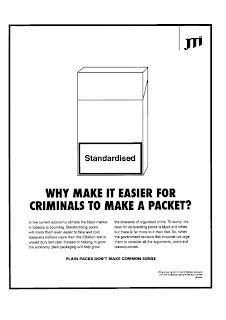 Gallaher ran two ads in UK national newspapers claiming that government moves to potentially introduce plain, standardised packaging will be a boon for criminals trading in fake cigarettes. 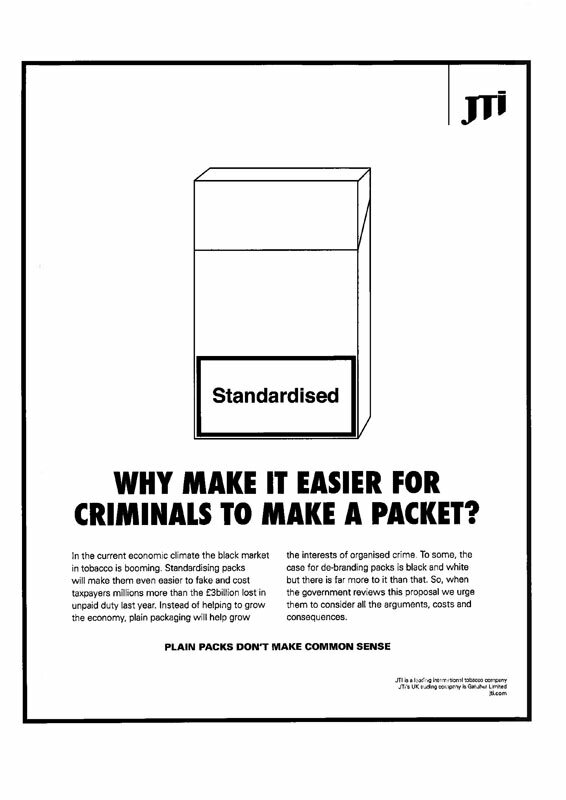 "What make it easier for criminals to make a packet? … The black market in tobacco is booming" runs a line in one of the ads. "Standardising packs will make them easier to fake and cost taxpayers millions more than the £3bn lost in unpaid duty last year." Cancer Research UK lodged a complaint with the Advertising Standards Authority that the claims that the black market is "booming" and that £3bn was lost in unpaid duty were misleading. The ASA referred to a report from Her Majesty's Revenue and Customs, Tackling Tobacco Smuggling: Building on Our Success, which stated that the "tobacco illicit market had been reduced significantly over the last decade". The ASA also found that the HMRC used upper and lower limits for estimating losses from unpaid duty – ranging from about £1.2bn to £3bn for cigarettes and hand-rolled tobacco. It said that Gallaher's ads do not state that the £3bn figure is not just for cigarettes, which most consumers would expect from reading the ads. The ASA concluded that the ads were misleading and told Gallaher they must not appear again without changes. "This ruling comes as a result of one complaint made to the ASA, from a group which campaigns and lobbies for tobacco control measures rather than from any member of the general public," said Paul Willimans, head of corporate affairs at Gallaher's parent company Japan Tobacco International. "Whilst we will not publish the advertisement in question again, we disagree with those who appear to wish to close down this debate by challenging the semantics of our statements rather than the substance. We will continue to express our concerns, as it is essential that common sense and sound evidence prevail." Last month Ash, Ash Scotland and Cancer Research UK won a ruling from the ASA banning Gallaher's first round of ads taking aim at the Department of Health's consultation on the introduction of plain packs. The Wall Street Journal wrote that a new poll shows New Yorkers strongly support Mayor Michael Bloomberg's proposal to keep cigarettes out of sight in stores. Although in this instance the move doesn't signal the introduction of plain, standardised packaging, it does strongly suggest another step forward in protecting children from taking up the habit by keeping tobacco out of sight. Sixty-eight percent of city voters back the idea in a Quinnipiac (KWIHN'-uh-pee-ak) University poll released Thursday. Thirty percent oppose it. Bloomberg wants to require cigarettes to be out of public view until a customer requests them. The City Council hasn't yet taken up the idea. Stores could display tobacco advertising. But Bloomberg says making cigarettes less visible still would discourage young people from smoking. A spokesman for cigarette maker Altria Group Inc. says the proposal goes too far by keeping cigarettes out of sight for adults, too. He says the poll suggests some New Yorkers agree. The poll questioned 1,417 city voters. The margin of error is 2.6 percentage points. ASH Scotland chief executive Sheila Duffy responded in Talking Retail today to the new advertising campaign led by Japan Tobacco, which featured on this blog yesterday. Health campaigners at Action on Smoking and Health (ASH) Scotland have responded to reports of a new advertising drive by Japan Tobacco International opposing the Scottish Government’s support for plain, standardised packaging for tobacco products. ASH Scotland chief executive Sheila Duffy said: “Governments around the world are trying to tackle the harm caused by tobacco and a growing number, including Scotland, believe they have found a new tool to help. As more and more countries look at introducing plain, standardised packaging the tobacco companies are clearly rattled by something they claim won’t work and are spending millions of pounds opposing it. “When tobacco companies, and the front groups who speak on their behalf, say there is no evidence to support standardised packaging, what they mean is that it is a new idea. But while every idea was new once this one has been thoroughly tested and passed with flying colours. To view the story in Talking Retail, click here. A Philip Morris report suggests thousands of jobs are at risk if plain packaging for cigarettes and tobacco is introduced. The industry led report argues that thousands of jobs could be lost with convenience stores across the UK closing for good if plain packaging for cigarettes and tobacco products is introduced, according to a report released today and commissioned by Philip Morris Ltd. The report suggests up to 30,000 out of the 182,300 jobs in Britain's small independent retailers are at risk and concludes tobacco purchases will migrate to illegal street vendors, larger stores and purchases from abroad. Douglas McWilliams, co-author of the report, said: "Convenience stores depend heavily on tobacco sales and the associated spending by those who drop in to buy cigarettes. The Independent today writes that Japan Tobacco International (JTI) – makers of Silk Cut and Benson & Hedges – will today publicly contest claims that banning branding on packets will lead to a reduction in the number of young people starting smoking. The company plans to reveal correspondence from the Department of Health, obtained through Freedom of Information requests, which it says calls into question the science behind the ban. Scotland is set to become the first part of the UK to enforce standardised packaging as part of its efforts to make the country “tobacco free” by 2034 – the equivalent of less than five per cent of the population using cigarettes. Smoking rates among lower income communities north of the border remain at 40 per cent. The Scottish government, which led the way in introducing the smoking ban seven years ago, hopes that outlawing branding will make the products less attractive to young people. It is waiting to see the results of a UK-wide consultation before deciding whether to go it alone. But JTI is publishing Whitehall correspondence from 2011 in which officials state that the new law would have no impact on cutting smoking rates. Sheila Duffy, chief executive of the health charity Ash Scotland, said “Tobacco companies have utter contempt for their consumers and have never intended to make them aware of the harm caused by their products. They have thrown money at misleading people and protecting their investment".